Drama Amid Indonesia's Disappearing Mangroves Indonesia has the largest share of the world's mangroves — coastal forests that have adapted to saltwater environments. They play important environmental and ecological roles. The challenge is convincing locals that they benefit more from protecting the trees rather than cutting them down. The rising tide laps at the feet of local children and fishermen and submerges all but the tops of the mangrove trees of Tiwoho village in Indonesia's North Sulawesi province. At one degree of latitude north of the equator, the climate here is about the same all year round: hot, wet and perfect for the forests of salt-tolerant trees that grow along sheltered coastlines. Indonesia has one-quarter of the world's mangrove forests, but it's losing them at an alarming rate of 6 percent a year. 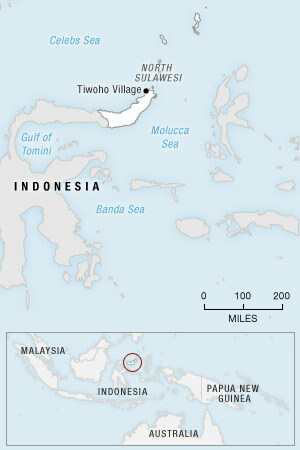 The world as a whole is estimated to have lost half of its mangroves in the past half-century. The flooded forests help protect coastlines from tidal floods and erosion, provide a home to an important variety of biodiversity, and provide important absorption of the world's carbon dioxide. But for the villagers, the mangroves have meant something else. The villagers used to cut down the trees for firewood, timber and to make shrimp ponds. But two decades ago, farmer Kamal Amani and other villagers began to replant them. "Looking at the mangroves now, I am very pleased," he says, surveying the expanse of vegetation from a hilltop. "I am proud of what we have achieved for future generations. And we're very proud of Professor Jamaluddin." Rignolda Jamaluddin, a marine scientist at a local university, has devoted himself to rebuilding North Sulawesi's mangroves, one village at a time. He says he has tried to explain to the residents how the mangroves serve as a breeding ground for the tuna and grouper that teem in the local waters, protect the shoreline from tsunamis, and provide an abundance of useful materials that can be gathered without harming the forest. "We can take benefits from the mangrove by not cutting the trees," Jamaluddin says. "For example, we make alcohol, we make sugar from mangrove trees." Villagers have also learned to make and sell bamboo furniture and develop ecotourism. The mangrove forest also protects a neighboring ecosystem: the coral reefs, which are a favorite with divers. The mangroves help to filter and capture river sediment that would otherwise bury the reefs. 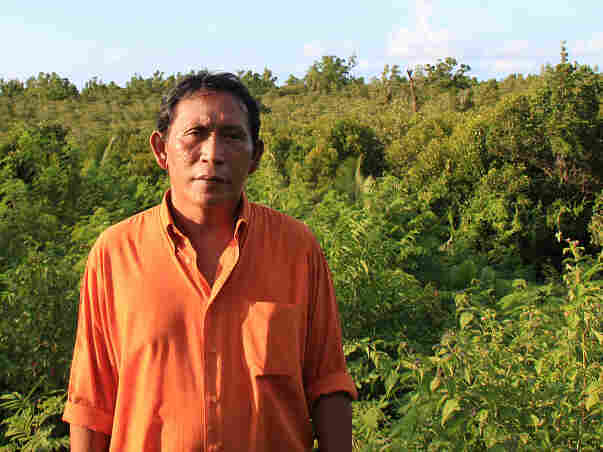 Rignolda Jamaluddin, a local marine scientist, stands in front of the mangrove forests of North Sulawesi that he has worked to rebuild over the past two decades. Part of his strategy included educating villagers on ways they would benefit from not cutting down the trees, such as making alcohol, sugar and furniture from the trees. Jamaluddin walks over the sandy soil and into the thick underbrush of the mangrove forest. At first glance, all seems silent and deserted. But look and listen closely, and you'll find a microcosm of constant change, cycles of life and death, growth and decay. Some mangrove roots poke upward through the soil to breathe, like an ocean full of snorkels. Other mangroves grip the mud with a lattice of roots, like the flying buttresses of a cluster of gothic cathedrals. All of them have adapted to their environment by developing filtration systems to survive in saltwater that would kill other trees. There's a constant snapping and popping sound in the forest, which Jamaluddin says is the sound of crabs snapping their pincers and mollusks shutting their shells. Those animals are not just tasty links in the local food chain; they're also helping to compost fallen leaves and organic matter, turning them into an underground layer of carbon-rich peat. Mangroves are a "very efficient living system in terms of sequestering carbon dioxide," says Daniel Murdiyarso, a climate change expert at the Center for International Forestry Research in Bogor, Indonesia. The carbon dioxide, he continues, is "stored in the leaves, and the leaves will be consumed by the feeders, including crabs and all those microorganisms below the ground." Murdiyarso says mangroves store five to eight times more carbon underground than above ground. The more mature the mangrove forest, the deeper underground its peat layer extends. Mangroves account for less than 1 percent of the world's tropical forest area, Murdiyarso says, but their destruction produces 10 percent of all carbon emissions from deforestation. Deforestation, meanwhile, is the second-largest source of carbon emissions after the burning of fossil fuels. Jin Eong Ong, a professor at the Universiti Sains Malaysia's Center for Marine and Coastal Studies, estimates that Indonesia's mangroves absorb and store enough carbon dioxide to offset the annual emissions of 5 million cars, roughly equivalent to all the registered vehicles in Massachusetts. A rising tide submerges mangrove trees and lifts local boats in Tiwoho Village in Indonesia's North Sulawesi province. 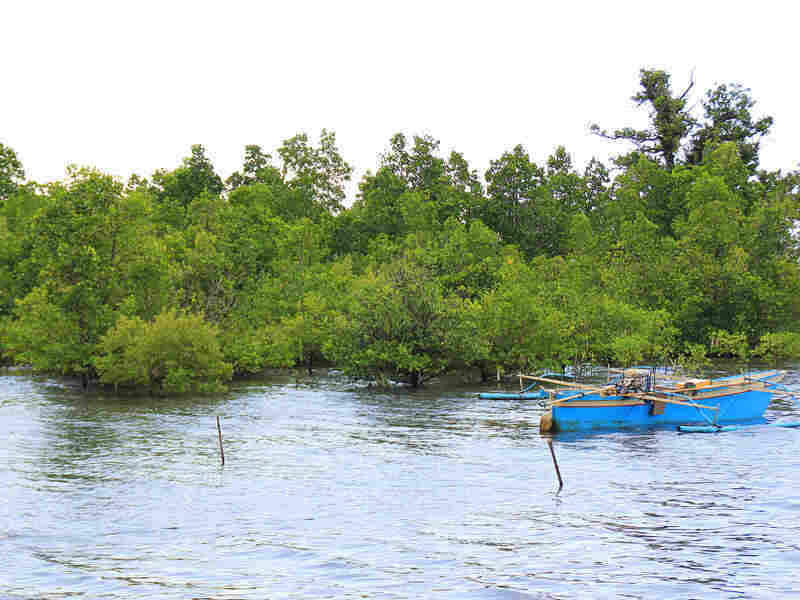 Two decades ago, locals began efforts to revitalize the area's mangroves. There's no doubt that Indonesia's mangroves provide many valuable services: storing carbon, filtering water and nourishing wildlife. The question is: How much are the services worth, and how can paying for them help protect the mangroves? In Jakarta, Forestry Ministry official Eko Warsito frames the problem this way: "More than 50 percent of Indonesia's population lives in coastal areas, and most of them are poor. An ordinary plot of mangroves is worth $84 an acre. But if it's cleared and planted with oil palms, it can be worth more than $20,000 an acre." Warsito says some developed countries, including Spain and the Netherlands, have already begun paying Indonesia to plant mangroves. In exchange, they get carbon credits that they can trade or use as a permit to emit carbon. The city of Jakarta is buying mangrove seeds from the Forestry Ministry and planting them in Jakarta Bay, Warsito notes. Restoring the mangroves, city officials hope, will stop saltwater from seeping inland and contaminating the city's water supplies. And, he adds, Indonesia is set to issue a presidential decree outlining a strategy for the sustainable management of its mangroves. Then again, in Tiwoho, the villagers have restored mangroves without government policies or foreign investment. The fact that the village is in Bunaken National Park doesn't seem to have helped the mangroves much. Jamaluddin argues that government management is less effective at protecting mangroves than community-based education. "If the local people have their own strategy, their own knowledge and the ecosystem already functioning naturally, then we don't need the regulation, like the national park," he says. "So just let them manage the resources in their own way." This is not just the most cost-effective way to protect the mangroves, Jamaluddin says; more importantly, it's nature's way.